Breeding Quality Quarter Horses Is Our Specialty! 3M is a working cattle ranch located in Grimes County, near Richards, Texas . It is owned and operated by Daniel and Helen Moriarty, along with their three children: Murphy, Stacie and Jerry. 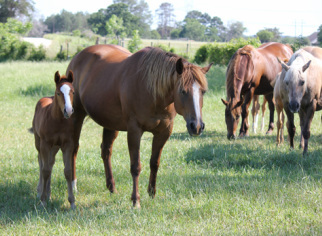 Moriarty family has been breeding quality ranch horses and commercial cattle for years. Not only is 3M Ranch a working operation for commercial cattle, but it is also a Quarter Horse Ranch with the horse program as an integral part of the overall ranching operaton. Jerry breaks and starts 3M's young horses. Then together Daniel, Murphy and Jerry use the horses on a regular basis for all the ranch work. You may also see Jerry showing 3M Ranch bred horses at the Stock Horse of Texas competitions. 3M's breeding operation has grown over the years and continues to maintain the highest standards for sound quality production. You can count on any horse coming from 3M Ranch to carry you through an honest days work, as well as becoming an outstanding Rodeo or Playday partner.